July 27th in Viral, Wordpress Plugins by Wordpress Jedi . Most savvy marketers understand the importance of A/B and multivariate testing. In the past few years, we have covered a whole host of plugins that let you test headlines and other design elements on your site. 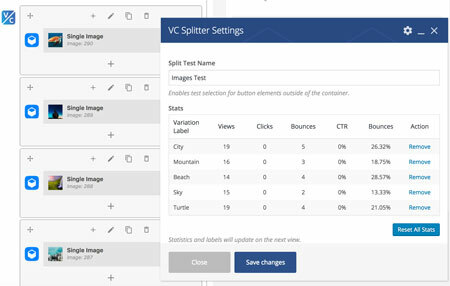 VC Splitter happens to be a Visual Composer plugin that lets you create A/B split tests and track your results. 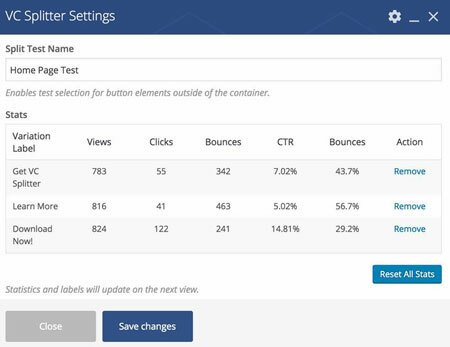 You will be able to track views, clicks, CTR and bounce rates for your tests. Using this data, you will be able to figure out which buttons, images, and headings work the best on your site. The plugin lets you set up your tests with a couple of clicks. Once you have added all your headings, images, and buttons, VC Splitter will deliver variations one at a time to test what works best. This is a paid plugin by SmarterSite.